Despite massive strides made over the past decades in medicine and science, understanding the workings of the human brain – the body’s most complex organ – remains one of the greatest challenges, as does finding solutions for brain disorders. To meet these challenges, major neuroscience research initiatives at a cost of billions of dollars have been launched around the globe and researchers are adopting new digital technologies to better handle the massive amount of health data being generated today. Together, these efforts are already starting to bear fruit. Below are five emerging themes in digital technology that may impact brain health. Scientists are increasingly looking to genomics – the study of the function and structure of genetic material – to better understand the causes of conditions such as autism and Alzheimer’s disease. 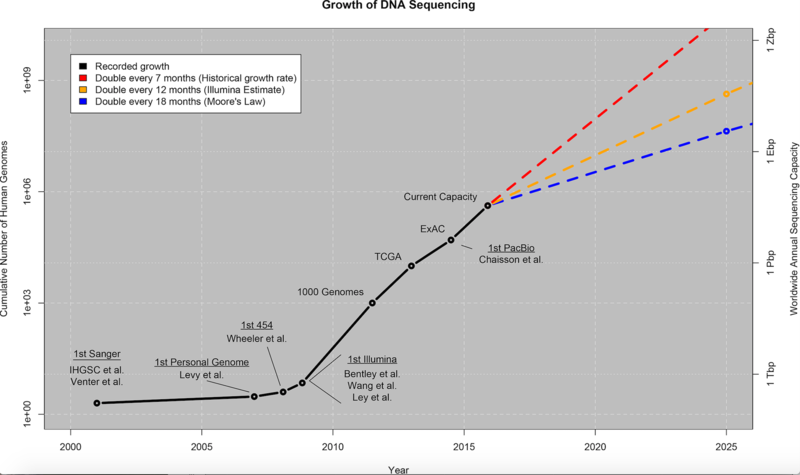 Advances in technology have caused the cost to sequence a genome to plummet over the past decade, greatly out-pacing Moore’s Law, and now researchers are faced with how best to acquire, store, analyze, and distribute this growing source of valuable data. Researchers estimate the computing resources needed to handle genome data will soon exceed those of Twitter and YouTube, posing a great technology challenge for researchers who are running larger and more comprehensive studies linking genetic variation to disease. The challenges of finding signals for genetic risk in brain-related disorders are immense. In autism, for example, the combination of many, possibly hundreds, of genetic variations increases risk, and there is also a huge range of variation in the characteristics of people with the condition. Identifying genetic risk signals requires enormous amounts of data, made possible only relatively recently by technical advances in the acquisition and processing of genomic information, as well as by the collaboration of scientists around the world. To continue advancing the understanding of the relationship between genes and clinical traits, scientists also need more accurate descriptions of symptoms, treatment outcomes, physiology and behaviour. Past decades have also witnessed widespread interest in using imaging technology to visualize the brain for Alzheimer’s disease, addiction, concussion, schizophrenia and other conditions, aiming to identify biomarkers that can accurately predict risk or diagnose brain disorders. As with genomics, the challenges are enormous to identifying meaningful signals that could indicate risk from the noise of normal variation of human brain development, function and ageing. For both genetics and imaging, cloud technology is easing the difficulty of storing and sharing the enormous amount of data needed to make sense of this biological complexity. Only a few years ago, it was a challenge to store and transfer just a few genomes, sometimes requiring physical delivery of hard drives. Now, cloud computing with on-demand IT delivery and pricing models make it routine for scientists to access huge datasets securely and collaboratively. In a recent HIMSS Analytics Survey , 83% of healthcare respondents reported actively using the cloud, with many hosting sensitive clinical data. The capabilities presented by machine learning – a branch of computer science in which programmes are designed to self-learn how to predict patterns from complex data – have multiplied in recent years with the advent of more powerful hardware such as graphics processing units and more publicly available large data sets. In brain health research, there is hope that machine learning will be used to identify signals of disease risk and treatment response from massive biological and behavioural patient data. Machine learning algorithms are also being developed for state monitoring, using behavioural data to detect early signs of when patients might deteriorate in conditions such as bipolar disorder, depression and psychosis. Other technologies enabled by the hardware and computational advances underlying machine learning include improved speech recognition software, which can support new methods for patient interaction, and enhanced visualization in medical imaging, enabling information from multiple imaging sources and techniques to be combined in real time. Although the promise of artificial intelligence is great, some are uneasy about the prospect of machine-derived decisions replacing human expertise and judgement. These concerns must be addressed with respect if the real potential is to be realized. Rather than artificial intelligence, the goal should be augmented intelligence, whereby technology serves to enhance human interpretation and decision-making. An estimated 50% of patients with chronic diseases in developed countries have less than optimal treatment outcomes because they fail to follow medical instructions. Further, analysts have estimated that billions of dollars are wasted each year in the US through unnecessary escalation of treatment and recurrence of disease. Remote wearable sensors – from fitness trackers and smartphones, to physiological monitors and smart skin patches for monitoring body chemistry – may improve and enhance patient health by enabling patients to collect their health and behavioural information automatically. Such data may be transmitted to doctors, and could also allow individuals to gain greater insight into their health and behaviour. With respect to mental and neurological disorders, patient states often fluctuate, but their doctors are only able to assess conditions based on snapshot views during office visits. Continuous monitoring may help give a more complete and accurate picture of patient conditions, improving the effectiveness of care when patients need it, or even anticipating when they need it. Outside of the monitoring that occurs during clinical visits, data is often self-reported, and may be incomplete or biased. Remote sensors therefore present a potential for enhancing the quality and resolution of data, and reduced cost of clinical trials may be the first multibillion market opportunity for this technology. Before this promise can come to fruition, however, the onus is on sensor developers to ensure that devices deliver clinical-grade data that can be meaningfully and safely used in medical decision-making. People suffering from depression, addiction and other mental illnesses often have to cope in silence for fear of stigma or because they are unable to obtain care. The economic burden is significant – mental illness costs the US nearly $193 billion in lost earnings every year; worldwide, the cost of output lost to mental illness is estimated to be in the trillions. Digital platforms combining technology and the human touch may provide an affordable and accessible way for patients to receive care. Further, these digital tools are helping add an important level of transparency as to cost and quality of care, to aid consumers in making a more informed decision about their care. These added benefits of transparency, added reach and personalized experience are aiding the healthcare industry to move to a more patient-centric care model. Studies have shown that more engaged patients (and their caregivers) are more compliant patients, which helps reduce costs and results in better clinical outcomes for patients. Containing hundreds of cell types with complex and dynamic wiring, the brain operates at multiple scales. Understanding, even at a basic level, how neural circuits underlie human’s subjective experience and behaviours remains an enormous challenge to neuroscience. One response has been the creation of community-wide knowledge, reflected in the steady growth of open repositories for data and technology. Private and public organizations around the world are investing in the creation of large, publicly-available repositories for brain research. As these repositories proliferate, and the kinds of data being shared diversify, standardization and curation become a major challenge. As science becomes more open, numerous privacy and intellectual property questions remain regarding human data. Informed consent is a start, but often, patients may not understand what rights they are signing away or researchers may wish to use valuable data for a purpose they had not previously considered and are lacking the consent to do so. Patients, researchers and lawmakers should work together to highlight the benefits of open data and open science, but mechanisms should be put in place that educate patients on their data rights and allow researchers to obtain the appropriate level of consent to cover a wider, yet contained, area to support their research.